Fall is the time of year most Southern gardeners yearn for (check out any Southern gardener's Blotanical Favorites for confirmation of that). Just like Northern gardeners who yearn for Spring because of the many barren winter months, we yearn for fall to get relief from the burdensome summer heat (which starts in "spring" of course!). Fall is a great time for planting here. Roots can start to plump out and the plant won't have to endure heat (though sometimes lack of rain can be a problem). We get the last hurrah of the roses and other flowers, like the sasanqua, are starting to come into their time of glory. So normally I start a new season of planting at this time. However, this time it's mainly my friends who have done that. That's because most of my effort so far has been in giving them my seedlings and other plants that need dividing. So they're busy planting everything I've managed to give away - good for them and good for our town! I love passing along plants. I have managed to plant one new thing - the lovely hydrangea at the top of this post. It's "Mini Penny Hydrangea" (H. macrophylla). 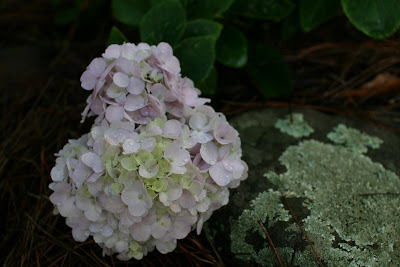 I usually prefer the lacecap hydrangeas to the mopheads like this. But we don't get a lot of variety at the nurseries in my small town this time of year. And since I really wanted a hydrangea for this one spot, I chose this one. What I'm excited about is that it's relatively compact, growing to just 3 to 4 feet high and wide. We'll see! I also snagged a buddleia for me because of my never ending quest for more butterflies. 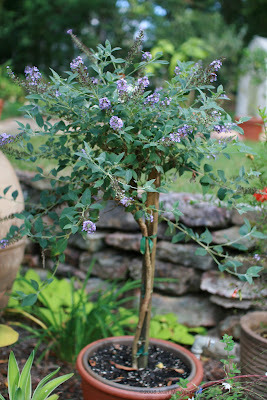 It's supposed to be a Nanho Purple Butterfly Bush but I think it was mislabeled (it came from a big box store, what can you expect). The other reason I bought it is because it is a standard and I don't have a lot of room for how big these normally get. I had planned to plant it in front of the rock wall but I think I like it better there when it's in a pot. It clears the top of the wall instead of competing with it. So it's temporarily sitting there, waiting for a decision from the head gardener (me, of course). Also new for fall is this lovely fungi. They're growing all over the back on rotting stumps. 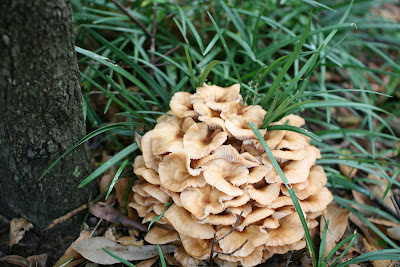 It's interesting because I normally associate mushrooms with rain but we haven't had any rain since the hurricanes. Pretty, isn't it? I know exactly what you mean about fall being the prime planting season for Southern California. I've just ripped out some scraggy 'non-performers' to make room for more luscious plants that I'll put in over the next month or so. And that Hydrangea is to die for! I have quite a few in my front garden, but the heat/dry winds have pretty much forced them into dormancy for the rest of this season.